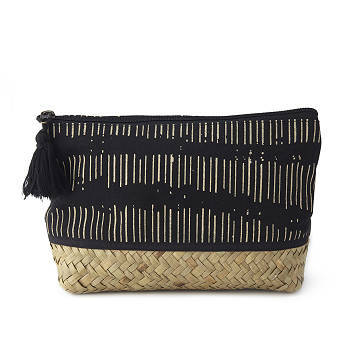 Gear up for your next getaway with this woven seagrass and organic cotton pouch. Looks like you just found your new travel companion. This beachy, woven seagrass and organic cotton pouch is a must-pack for your next getaway. Fill it up with toiletries and slip it into your suitcase (it'll stay secure thanks to that cute tassel zipper), or keep it on-hand as a clutch for nights out—can't you just picture it with your favorite flowy sundress? Handmade in Cambodia.